"In Line of Those Areas To Rise..."
Suppose that you were a Navy officer in 1943 and had asked the sleeping Cayce about the wisdom of establishing a home in Norfolk, Virginia. What would you think of this response from Cayce's source? Perhaps your first reaction would be to assume that the reading was addressing the safety of your home environment in a time of future socialturmoil. While that might make sense if areas were to rise up in human turmoil, such an inference is wholly out of place in relation to the phrase "while many a higher land will sink." The entire reading fragment seems to make sense only when considered in relation to east coast tectonic activity and, perhaps, any concomitant social turmoil related to the beginning of Earth-changes due to a year 2001 pole shift. Like some other readings on coming Earth changes, the changes predicted in 2746-2 appear not to be designed for the immediate recipients. Instead, the changes seem most applicable to people alive today. Through those periods of turmoil [between the King and the Priest] the entity gained, as related to the manner in which individuals of various groups...needed to be helped. So in the present experience [here, WWII], the entity is passing through those periods that may be represented (figuratively, to be sure) by those periods of turmoil in that land. Now it turns out that our Navy officer was none other than Lt. Harold G. Allen, who in 1942 with his wife Eula, became members of the Tuesday evening Bible discussion group led by Edgar Cayce [the reincarnation of the Priest in Egypt]. After the end of WWII, Harold became Publications Director at the A.R.E., reporting to Hugh Lynn Cayce [the reincarnation of the King in Egypt]. He managed the A.R.E. Press for 12 years, expanding it from a mimeograph machine to a well-equipped printing plant. Coming under the activities of the King [Hugh Lynn Cayce] as authority, later the Priest [Edgar Cayce] as in the spiritual activity, and later as an emissary in the actions in other lands. The name then was Tek-El-La. In the activities the entity gained. Let's turn now to the matter of trying to understand what the few lines of reading 2746-2 might be trying to tell us about Norfolk being "in the line of those areas to rise." What do geologists know about the crust and its structure buried beneath the coastal plain sediments of the southeastern United States? Is there any evidence for vertical movements, however slight they might be, in the Coastal Plain? Movements that might give us clues to potential uplift of the land surface along some sort of a line pointing toward Norfolk? Indeed there is! In February 2000, R.T. Marple and P. Talwani published a research study entitled, "Evidence for a Buried Fault System in the Coastal Plain of the Carolinas and Virginia-Implications for Neotectonics in the Southeastern United States" (Geol. Society Amer., Bull. v. 112, no. 2). The authors collected geologic and geophysical information that clearly suggests the presence of a 375-mile-long, north-northeast-trending buried fault system, which they designated the East Coast Fault System (ECFS). They describe evidence for the system from the deformation of flood-plain sediments and alterations in stream courses during the past 130 to 10 thousand years. And they conclude that the deformation "may be ongoing" today. Marple and Talwani also think that the fault system traverses the epicentral area of the 1886 Charleston earthquake, and that the system could have been the source not only of that earthquake, but other large prehistoric quakes in the region. We have plotted the three segments of the East Coast Fault System on the AAA highway map to the right. Plotted also are the axes of two arches in the sediments and underlying rocks of the Coastal Plain, the Cape Fear arch (CFA) and the Norfolk arch (NFA). Marple and Talwani cite studies that show that the eastern United States has been experiencing east-west compressional deformation for perhaps the last million years. In response to this compression, crustal rocks buried beneath the Coastal Plain sediments are undergoing local vertical uplifts along the trend of the ECFS. This has been going on for at least the last 130 thousand years. Current uplift rates along the ECFS are estimated to be slow (0.02 to 0.3 mm/yr). The fastest rates of uplift are in the southern segment and the slowest in the northern. Regional uplift associated with the Cape Fear and Norfolk arches terminates to the west against the East Coast Fault System. Initiation of faulting along the ECFS, perhaps a million years ago, "decoupled the upper crust west of the ECFS from the crust to the east. Consequently, regional uplift was terminated to the west against the fault system..."
We'll now put the foregoing into simpler words, to help us relate the research findings to reading 2746-2. Note first that the map shows the approximate crest-lines of the two arches. Each arch trends roughly perpendicular to the trend of the ECFS. These arches may be considered to be regions of relative stability in their respective portions of the Coastal Plain. Uplift of the land surface is occurring all along the buried ECFS, while relative uplift of lands along the east and west sides may vary along the trend of the system. Now suppose that the poles begin to shift and Earth's continents begin, however slowly, to converge. 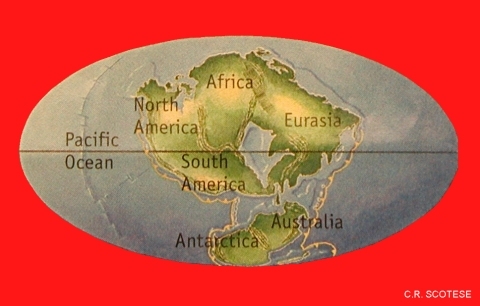 Christopher Scotese, a geologist at the University of Texas at Arlington, has suggested that in another 250 million years, Africa and North America will be squeezed together again, just as they were some 275 million years ago. The initiation of the closing of the Atlantic could accelerate the ongoing trend in E-W horizontal compression of the Coastal Plain of Virginia and the Carolinas. Mildly accelerated compression could produce uplift along the ECFS. In agreement with the present trend in uplift rates, the greatest uplift would begin in the southern segment of the ECFS, with lesser rates of uplift occurring as one moved northward. If so, a person living in Norfolk might conclude that his hometown could be "in the line of those areas to rise." But such a conjecture would be wrong because the northern end of the strip of land rising progressively from south to north would turn out to be well west of Norfolk (see map). The Norfolk area itself would be little affected, being on the crest of the relatively stable Norfolk arch. The observation that "many a higher land will sink," follows from a realization that pole shift could activate tectonic forces leading to crustal sinking in certain higher lands to the west of both Norfolk and the ECFS. Note here that I am assuming that the historically-unprecedented Earth changes predicted in several Cayce readings will be the result of significant movements of Earth's crust due to the pole shift of 2000-2001, as forecast in 826-8. Reading 3976-15 states that "these [Earth changes] will begin in those periods in '58 to '98..." And reading 364-8 implies that the historically-unprecedented changes will take place after His return in 1998. Then, "As given, for a thousand years He will walk and talk with men of every clime..for this will be when the changes materially come" [emphasis added]. And because a thousand years is a short time, geologically-speaking, it seems clear that only by the upheavals to Earth's crust as generated by a pole shift will it be possible to achieve the changes predicted. There is a complicating factor in the pole-shift-induced ECFS uplift scenario. The southern end of the southern segment of the ECFS is located in an area that is predicted to sink in a different reading. As to conditions in the geography of the world, of the country, changes here are gradually coming about. Portions of the now east coast of New York, or New York City itself, will in the main disappear. This will be another generation, though, here, while the southern portions of Carolina, Georgia - these will disappear. This will be much sooner. The southern portions of Carolina and Georgia that are to disappear are shown in orange on my map of Earth changes, labeled "SU" to denote submergence. Perhaps the northern part of this orange area should be changed to show submergence of only the land on the east side of the southern segment of the ECFS. In passing, we should also note that the " much sooner" timing of the predicted submergence seems to be in error, unless submergence is to begin with commencement of the pole shift. If so, in "another generation" (33 years?) New York City will begin to be submerged. ...the work of the entity should embrace most all of the areas from the east to the west coast, in its persuading - not as a preacher, nor as one bringing a message of doom, but as a loving warning to all groups, clubs, woman's clubs, writer's clubs, art groups, those of every form of club, that there needs be - in their activities - definite work towards the knowledge of the power of the Son of God's activity in the affairs of men. This is identified with the Christian forces. Hold fast to the basic principles in that phase of same. There may be help there, but not as identified with same. This is the identification - the Christ-like principle! ...we find that the entity was in the Atlantean experience when there was the breaking up of the land itself, through the use of SPIRITUAL truths for the material gains of physical power. Yet the entity was among those that were of the children of the Law of One, in the name Aian. In the experience the entity was among those that ministered in the Temple of the Sun, from which all power was used for aid of those in material things. Yet the entity was among those that understood how that the spirit of those that are given charge concerning the affairs among men came again and again, and gave the power to those that remained true in and among the sons of men! When those periods came for the dissolution of the Earth's surface, upon which and through which the activities in the Temple were to be destroyed, the entity aided in giving those instructions for the preservation of the lives of many of the faithful, to go into other lands. Hence, after much of its goings about in the activities among various groups, the entity came to the Egyptian land. Strengthening the lives of the faithful turned out to be Mrs. 1152's mission in the latter days of her life. And the last sentence in the reading above reminds us of the trek of our Navy officer in those days of the destruction of Atlantis and the migration to Egypt. Here are two interesting souls whose life paths in an Atlantean-Egyptian experience ended with somewhat similar trajectories in those bygone days. But let's return to Mrs. 1152's eleventh reading, given in August 1941, four month's prior to America's entry into WWII. Here in the last passage quoted below we find strong evidence of the predictive value of this Cayce reading. For, with those changes that will be wrought, Americanism the ism - with the universal thought that is expressed and manifested in the brotherhood of man into group thought, as expressed by the Masonic Order, will be the eventual rule in the settlement of affairs in the world. Not that the world is to become a Masonic order, but the principles that are embraced in same will be the basis upon which the new order of peace is to be established in '44 and '45 [emphasis added]. Although no one would have predicted it in 1941, a new order of world peace was achieved in 1944 and 1945. This prompts us to be more confident in the eventual realization of the Earth changes predicted in this reading, as catastrophic as they may be. Those Earth changes not yet cited from the 1152-11 reading are given below. Then, with the knowledge of these, -- first the principles, then the material changes. The choice should be made by the entity itself as to location, and especially as to the active work. To be SURE there is work to be done by the entity, DEFINITE work. Join with all of those who declare that the Lord has come and that His day is again at hand. (Q) Should this work start by early fall? Q Is Virginia Beach to be safe? A. It is the center - and the only seaport and center - of the White Brotherhood. A final concluding point should be made with regard to the present safety of the Virginia Beach-Norfolk area. While physical safety in 1941 could be considered to be better than in some other areas at the time of reading 1151-11, safety today involves numerous factors other than those that obtained 60 years ago. Today's increased population density and energy requirements, and diminished capabilities for local food production are significant differences. Water supply to support the area's increased population required the City of Virginia Beach to build a 70-mile-long supply pipe from a lake in North Carolina to reservoirs west of Norfolk. 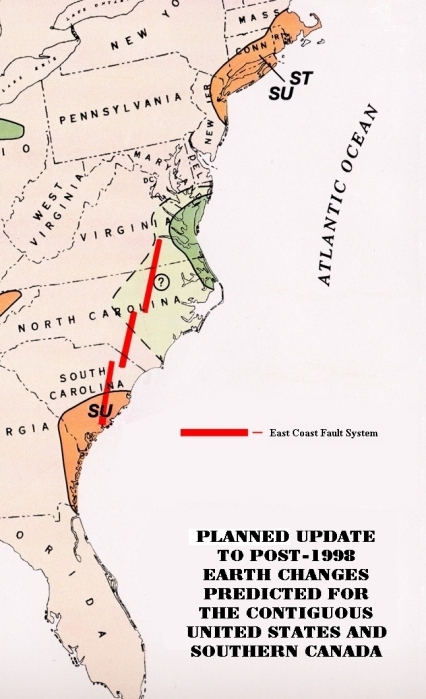 As seen in the figure below, this supply line cuts across the northernmost segment of the East Coast Fault System. The vulnerability of this and other such "lifeline" engineering works (electrical and telephone lines, oil and gas lines, etc.) to movements along the ECFS cannot, unfortunately, be realistically assessed in such a speculative article as this.